near the center of North Truro, Massachusetts on Cape Cod. From the Sagamore or Bourne Bridge take Route 6 East about 37 miles to the Orleans Rotary. (Rotary is 2 miles past Exit 12). Continue on Route 6 East toward Provincetown approximately 16 miles. After seeing the "Entering Truro Sign, you are about 10 minutes from the Moorlands Inn. Continue on Route 6 then take a LEFT at "Route 6A, Shore Road, Beach Point, North Truro" sign, Then take the first LEFT onto "Hughes Road", (small green & white street sign), go one block, then RIGHT at the STOP sign. The Moorlands Inn parking area is your immediate right after turning. 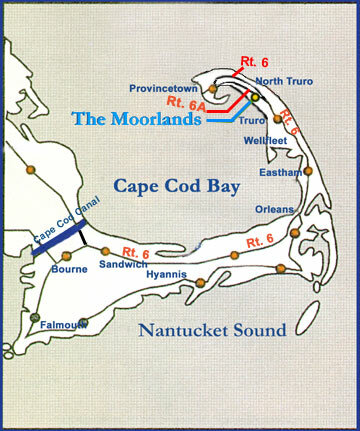 From Provincetown, take Route 6 West to Route 6A West through North Truro center. Bear right onto Hughes Road at the Christian Union Church. The Moorlands is on the left about 1/4 mile up.